Here is the completed build, see the original first post below. Thank you Pat for letting me use your class room over the past 3 years to build, tinker, and play. You always half joked that I should build you one of my arcades, so here you go. After more then two and a half years in Tanzania, our time in Africa is coming to an end. As we prepare to move on to our next post we’ve had to say some tuff good buys. I’ve been very lucky to make some close friends, one happened to be the Design & Technology (DT) teacher, Pat. When we first meat he needed some one to fix the DT lab's 3D printer so I volunteered. Over the next two plus years we repaired, assembled, and figured out how to get every CNC in the DT lab to work. Pat also allowed me to use his class room (the DT lab) to build my first and all but one of my other Arcade builds to date. In the past he has asked half joking when he’s getting one. Well this one is for him. I’m kind of far along on this one. In fact I wasn’t planning on starting a thread till after it was done. It seems what started out as a build something out of whats ever I had around project, is actually turning into something nice. I thought you guys might help keep me from messing it up. Here’s where the build is at at the time of the first post. I have no idea why they won't post up right. If any one can post the code needed to fix them in quotes I would be most grate full. It’s a little ornate, but wanted it to have a Tanzania/Zanzibari feel. At the end of each school year the DT lab is cleaned out of the old student projects. The original goal was to do 100% of the build from this wast wood and the random parts for projects I never got to. I started with a top of a small rectangular crate. Then I cut some boards into strips and glued them together to make a base. Over the next few days I built up the frame using mostly glue, clamps and the would strips I cut. In fact there are only 4 screws in the frame. There in the triangles holding the base to the two long vertical strips. the rest was just glued and clamped. Added some support for the monitor to rest over. At this point was just going to skin it with some thing ply that was being throne away. Then had the bright idea to get a quote from the carver who did the dragon head for my pedestal. I won’t say exactly how much it was, as Pat will read this at some point. I will say this, you would be amazed how affordable it is to have things hand carved here. I used some poster board to trace my frame and added the details like the curve for use as a template. The top of the marquee frame is held in place with strong magnets from an old hard drive. Below is the photo I gave him for the carving. I still need to do some work on the it but want to settle on a game list. Was planning on a few classics but the 19inch monitor ended up horizontal and not vertical. Now I’m debating if a 6 button build would be better. I could add few Genesis (Streets of rage) and NES (Arkanoid) games as well, but only a few as I want a small list. The PC I have for this is a P4 running XP, but I may be able to get a Core Duo for it. Atomic FE is the front end I'm planing on using. Also I wanted to call it Afro Khon but could not decide if it could be construed as racist if taken out of context. What do you all think? Well this build is certainly unique and nontraditional for sure. Is the hing on the front-center aesthetic or does it serve a purpose? Awesome, unique, crazy and magical are words which spring to mind. It's beautifully carved. It's a shame about the monitor not being vertical as you wanted. Given it's horizontal, a 6 button layout would be my preference. The CP opens from a hidden hing in the back. That "hing" you see is actually an ornate latch. Thanks, coming from you that is quite the compliment. I made a mistake in planning and ended up with the 19'' only fitting in horizontal. The out side is finished up and back at the school. -Add some tinted class in front of the monitor. The CP has been bothering me. If you look at the lid on the build as it is now its beautiful. I don't know if I have the hart to put a bunch of holes in to it. Was thinking that I may be able to make some nice small fight stick like controller units that can be keeped under the lid. It's just so nice I don't want to mess it up now. 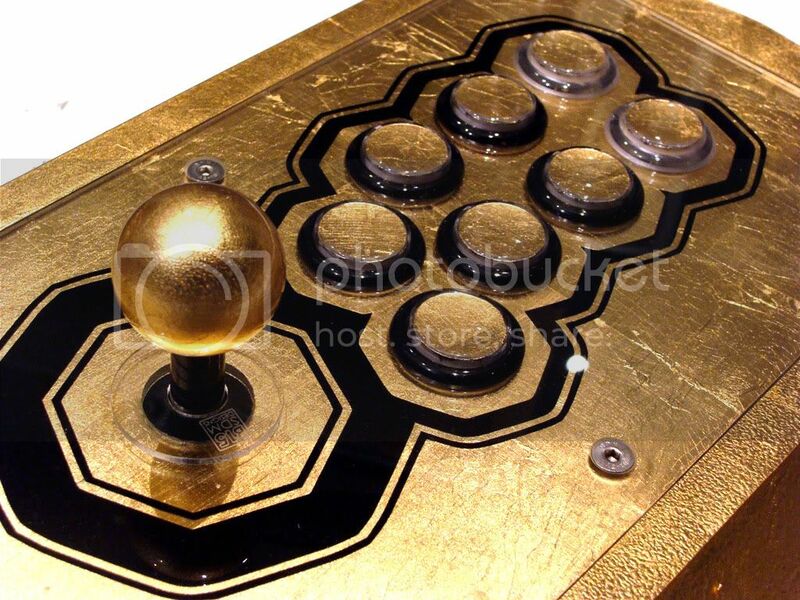 You should go with transparent Japanese buttons and do gold leaf inside the button plunger. Great job! That theme looks like a great fit emphatic ... and from a B15SDM Designs stick, no less. Someone should hack Donkey Kong to make the Jumpman and Pauline sprites black. Don't have $55 left in this build budget, but do have a lathe at the DT lab. Its new and I don't know how to use it but thats why there's you tube and instructions manuals. Will see if there is time. That's the schools IT office. It's summer brake. The school is being torn apart for renovations and he probably wanted to work on it with out the network going down. Thanks, was thinking of asking to use your ultimate donkey khan art as a base, but decided less is more with carved wood. So Afro Khon is a little over the top? I love the original concept you've got here. Relief carvings instead of side art, very cool and original. I did some more work on it yesterday and am happy with how it's going. While in the DT lab the IT supervisor/system admin asked me if I could help with the power tools for some work they needed done. We started talking about this build and he's going to try an find me a Core Duo for it from the storage room. I'll have some time to work on it tomorrow. Hoping to have all, but the software, done by next week. Zach Galifianakis hasn't aged much. The Africa character does a good job showing the level of frustrations real africans feel dealing with western stereotypes. Cracked.com (NSFW language) says it best. That's right: Instead of focusing on the rich wildlife and history, the tourism industry actually has to remind people that coming to their country isn't a F****** death warrant. So yesterday I was given the keys to the IT storage room and was told to help my self to an old core duo PC. I was also told that I may have to mix and match parts to make a full working system. I ended up with a core duo with 4gig Ram and Win7 pro. Had to run off after getting it to boot and forgot to look up the CPU specks. I'll add them later. I also found a milk crate filled with old video cards. It's an old card with modest specks, but it's better then the intergraded graphics on this old PC. Back door is on, for now. It needs to come off for hole cutting and painting. The door is a peace of ply I found that was just short of the with needed and was a little warped. I glued on some strips to flatten it back out. The black vertical strip was a piece of ply that was slightly thicker then the rest of the door. I passed it through the table saw a few times, making a lip. I then glue the two pieces together to cover the gap. Been working on the art and had the idea to use a pice of etched plexi, with a piece of defused plexi behind it. Something like the energy ball in my VS stick build. That was a test pice, the final was clear on the VS stick. Here are my two concept images. There is more work to do but I think I like the general concept. Was thinking of changing "Donkey" to "Afro" What do you think? Love the idea of the etched plexiglass for a build like this! I'd leave it as Donkey Kong myself. I mean, A) the guy you're giving it to lives in Africa, so he doesn't need a reminder, and B) I don't get the need for KHON. Did I miss the significance of that word? I dunno, using the carved Donkey Kong on the sides and a DK marquee makes it seem almost .... authentic. A punny name just makes it another MAME cab. Least that's how I see it. I don't get the need for KHON. Did I miss the significance of that word? I think your right. I kind of feel the same way about the one that replaced Nintendo with MAME. Originally this was going to be a vertical build with a 4way joystick. I made a mistake in the planning stage that I didn't catch, so now it's a horizontal with a zippy stick. If I had it to do over and a larger budget, I would have used a 14" SCART monitor, mounted vertically, true leaf buttons, and the pac reunion joy. That would have been nice, but as I said it started off as a "what ever is on hand" build. It's Jumpman Font - ( http://www.dafont.com/jumpman.font ) layer duplicated with a stroke added to the outside of each layer 1 black for the outermost and white for the inner upper layer so that it makes the outlines around the text. With a 15 month old, preparing for home leave for the month of August, and a move to a new country in September. I have found less and less time to complete this build. I can probably find a few more hours to work on it before I have to head back to the US. This is leading to some tuff calls, but I'll save that for the end of this post. Yesterday I drilled all the holes for the CP. I was planning to have the coin and start buttons side by side, but decided to offset them as I did not want to stress the small space in the hard wood to much. The lay out looks a little high but was done with comfort in mind. I also did some work on the back door by adding an exhaust fan. I think I found an extra fan port on the mother board that I can use. It would be nice to have the PC control the fan speed as needed. I have very little time to work on this before I have to leave for the US and the PC is still set up as a multi user work station, that requires admin pass words to make changes. I've asked the IT guys to do a fresh install or to loan me a Win 7 install disc and and the sight license key, but they for some reason done want to pass there key around . So my problem is do I throw XP on the PC so I can finish on time or do I risk them not getting to the fresh install on time? Are there any draw backs to using XP on a dedicated bar top build? I say go XP and be done with it. I don't foresee any issues if you're just throwing MAME on here. It's simples and you can do it now rather then risk incompleteness by having to wait. After getting XP running, I used the band saw to cut down the PC case down to the bare minimum to mount the mother board. Then mounted the mother board in the bar top. If I had an extra Kade I would have used it, but this is mostly a what ever's on hand build. Did some work on the Door. After I got it all in the PC gave 3 beep's and would not boot. I think I broke it Any help here would be appreciated. Scored some PC speakers that need fixing, going to work on them tonight after wife and baby go to sleep. gave 3 beep's and would not boot. I think I broke it Any help here would be appreciated. 1. Take ram out and put it back in ensuring it clicks fully into place. I forgot to mention that beeps are going to depend on the motherboard/bios. Is Jax holding his arms off-picture? Thanks for the link. It was 3 long beeps. I'll work on it in the next few days. Not to concern as there are 20 identical models in a some closet. Also, does any one know if I could connect the positive from the monitors on switch wire and the Computers on switch wire to the Happ on button in the back door and just run the ground to the power supply to have one button turn both on at once? Or would I need to add diodes? I recommend using a DPST (Double-Pole Single-Throw) or DPDT momentary switch instead. Thanks Scot, hopefully I can find one at my hardware store. So this took up most of my day. And it was a day well spent. During nap time I managed to take apart the broken computer speakers and found that the doble 10k potentiometer volume nob was not nearly detached but split in to peaces. I happened to have a single 10k potentiometer and thought of converting the speakers to mono. I ended up bridging some points to remove any manual volume adjustment. Now sound can only be controlled by software. This one's going down to the wire. I made some good progress, but now only have a week until I go on home leave. It came out well. It's slim enough that you can't see it from the player position. I pulled the mother board out to do some testing. Then decided to reinstall it flipped around with the CPU in the back. Now its fan can pull in air through a hole in the rear door. This required me to extend part of the power supply wiring. And finally, I got the PC running. Install the front end. I was going to use Atomic FE when I only had a P4 but now am thinking of using Attract Mode or Hyper spin. I need to find a Donkey Khon theme that I can tweak to fit this build. Does any one have one in mind? The construction is more or less Complete . If I had more time I'd have spend it fixing up the back door and cleaning up the inside, but for now I need to focus on the software. PC and monitor completely installed. I added a peace of plastic, that I custom shaped with the plastic bender, to direct the power supply fan out a vent on the back door. Why not just move the power supply to the back, you asked. It didn't reach, and this was a lot less work then extending the harness. Inside with the back door. The monitor is crooked but I'll fixed later. Door closed. If I find time I'll paint it black. Button inserts installed. The coin is a Tanzania 200 shilling. Here it is with the defuser installed, still need to add the etched persx. And here it is in his office.